SNAP INTO THE SEASON OF GIVING! DONATE NOW! You’ve heard about Black Friday. You’ve heard about Small Business Saturday. You’ve heard about Cyber Monday. Giving Tuesday is the charitable response to Black Friday and Cyber Monday – the way to kick off the season of whatever holiday you celebrate by giving…to your favorite charitable organization. This worldwide day of giving takes place the first Tuesday after Thanksgiving – this year, Tuesday, Nov. 27. 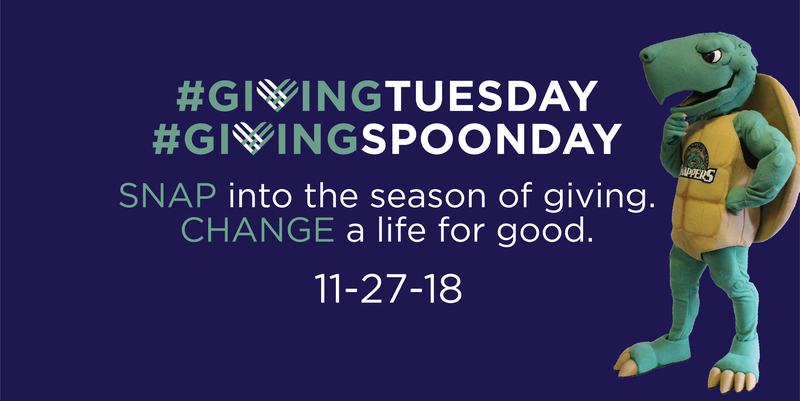 On Tuesday, Nov. 27, by making a gift to the Spoon River College Foundation, you have an opportunity to be a part of that movement right here at Spoon River College -- to "SNAP" into the season of giving; to help change lives for good. In short, anything you want at Spoon River College. While we encourage and appreciate support for our annual fund so that the SRC Foundation can quickly provide in the areas of greatest need at SRC, you can direct your gift to any scholarship, program or facility at SRC. All gifts are important and appreciated, and you make a huge impact, no matter what you give or where it goes. $15: A student's welding jacket -- safety first! $25: An hour of teaching for 10 students in our Adult Ed Dept. HELP A LOCAL STUDENT TODAY! GIVE TO THE SRC FOUNDATION! STEP ONE:Make a gift to the Spoon River College Foundation on November 27.​ (Can’t give online? Send us a check and date it November 27. And, of course, if you can't wait until November 27, that's okay! YOU CAN GIVE TODAY; just let us know you want your gift applied to #GivingSPOONday! STEP TWO: Send an e-mail to 10 of your friends, family, coworkers, neighbors – ANYONE that you think might be interested in Spoon River College. Tell them why you gave, and ask them if they’ll pass the word! STEP THREE: LIKE the Spoon River College Foundation on Facebook and share our #GivingSPOONday posts to your friends! On or before November 27, send an email or other message to your family and friends – tell them that this is happening! Tell them that you’re participating. Tell them why this matters to you. Tell them why this matters to them. Ask them to join you by giving or sharing with their friends and family. Print one of these flyers and post​, or allow us to post, in your place of business to help us launch the campaign – or, give directly to your customers! Or, show the world that you’re coming out of your shell by sharing SRC Foundation Facebook posts with the hashtags #GivingTuesday and #GivingSPOONday. Challenge your Facebook friends and Twitter and Instagram followers to join you in changing the world by starting right here at home. Change a life for good. At the Spoon River College Foundation, we’re firm believers that sometimes, all it takes is that one person giving you that extra boost toward success. On #GivingSPOONday, you can show the world that YOU are that one person. Spoon River College alumni have gone on to become educators, coaches, community advocates, engineers, doctors, nurses, meteorologists, business owners, farmers, world-renowned mechanics, and so much more – even a Harlem Globetrotter and United States Secretary of Transportation! Besides SRC, what did they all have in common? As we speak, we’re pointing the next generation of leaders in the direction of success. On #GivingSPOONday, YOU can change a life for good. ARE YOU READY? GIVE TO THE SPOON RIVER COLLEGE FOUNDATION! The SRC Foundation is a registered and approved 501 (c) (3) organization, and gifts may be tax deductible. MAKE YOUR MARK. DONATE NOW!